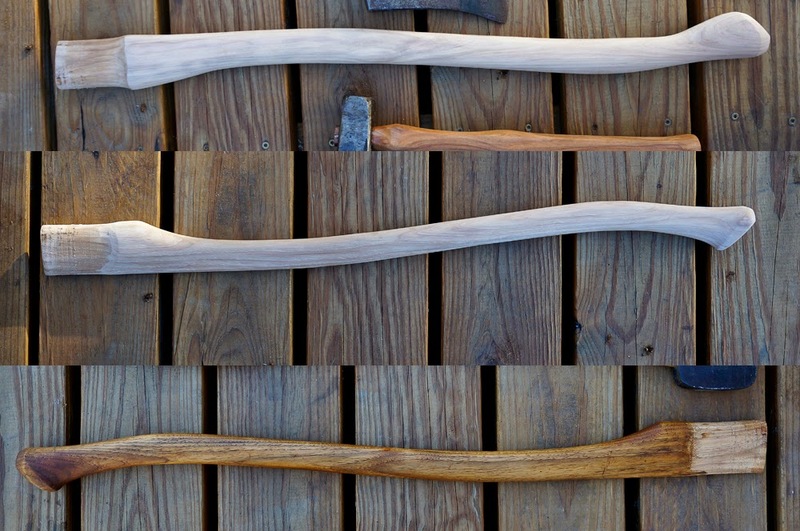 While I wait impatiently for my good handles to arrive I'm not left with many axe projects to work on and that ruins my day. 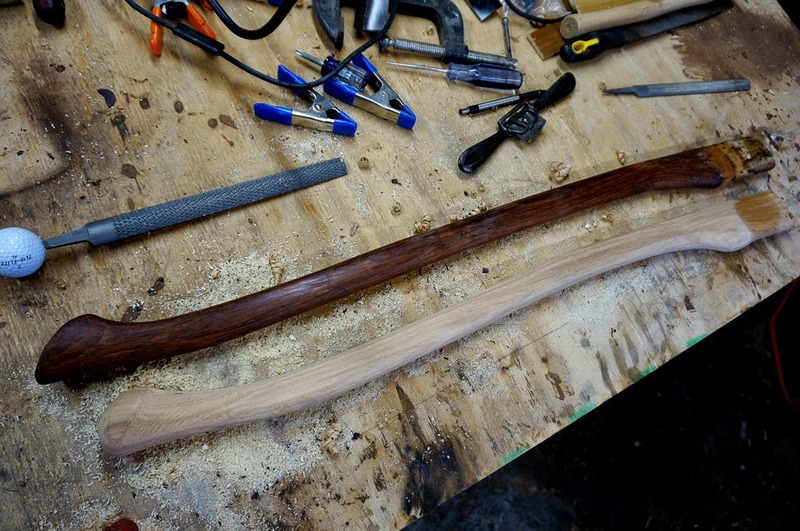 I got this 32 inch handle thinking I would need to put it on an axe for someone else and that ended up not happening. 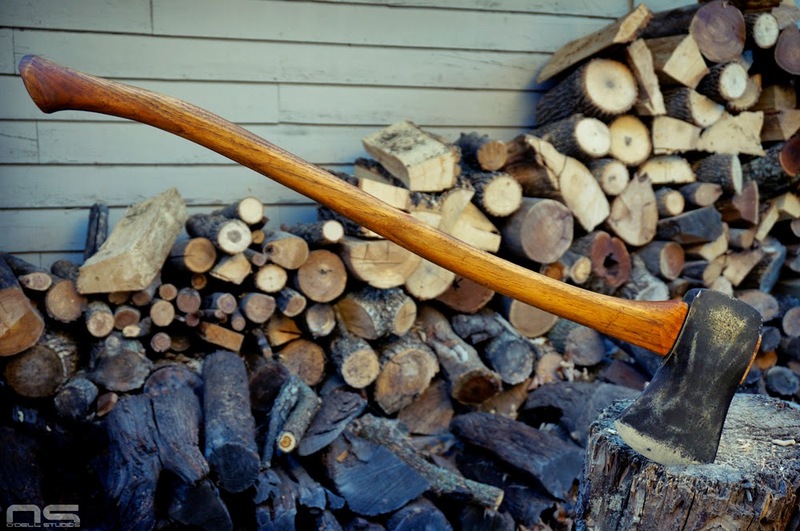 Meanwhile, my Craftsman axe with a handle I really like, has taken the place of my go-to axe for my day-to-day splitting chores and my old Wards just sits in a corner. 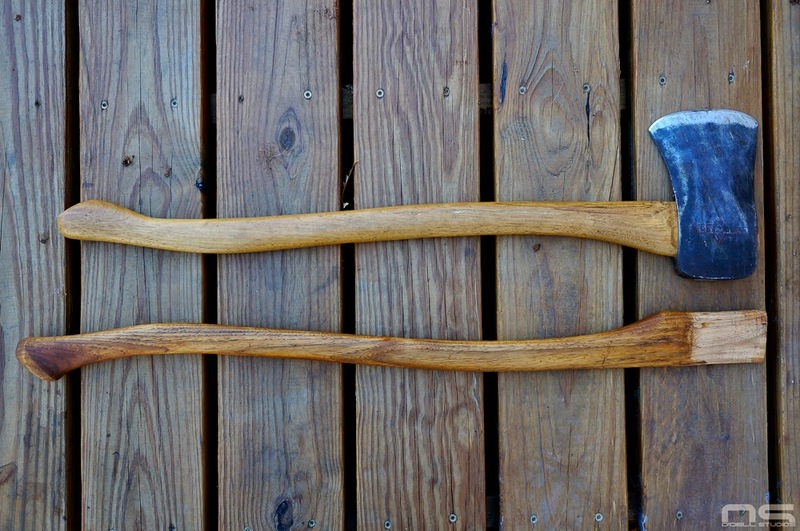 The Wards was one of the first axes I rehung and I didn't do anything to the handle before putting the two together. It served us well but the feel of a good handle makes it hard to pick up the Wards with its poorly contoured stick and severely lacking swell. 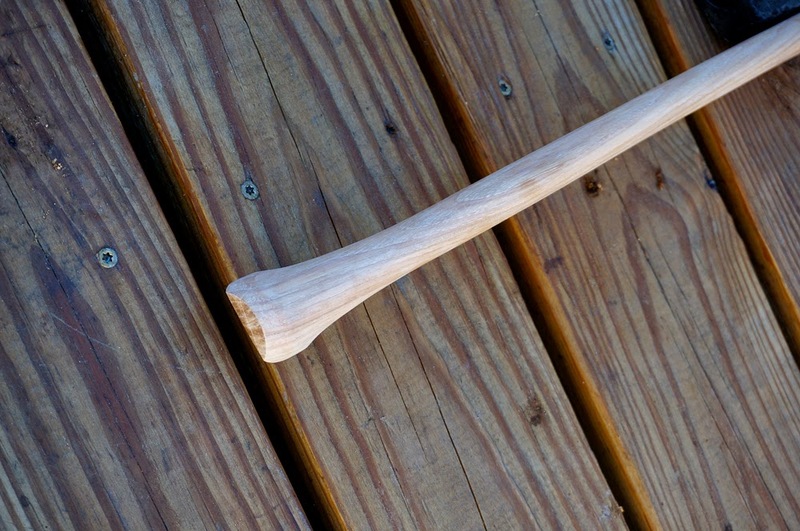 However, it's a great axe and I decided to replace the handle with something good, or at least a whole lot better. 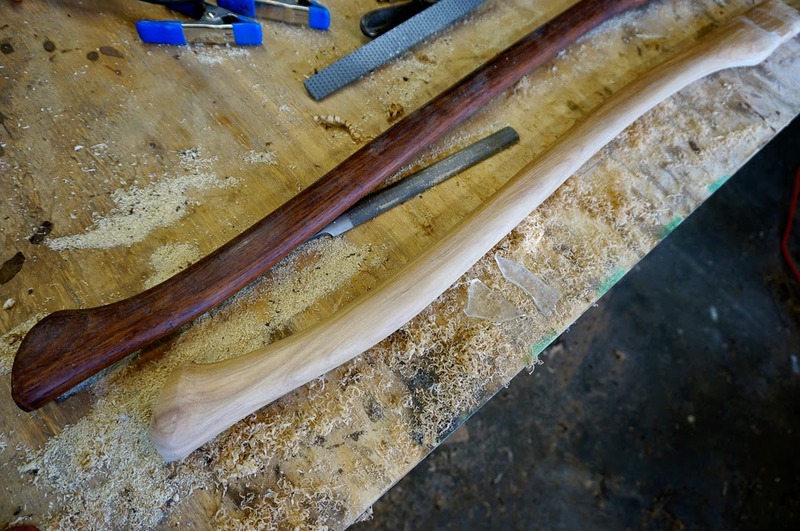 In the first picture you see a beginning, middle, and end shot of the new 32" stick. It came straight, with about 1-1/2" in the swell side-to-side, but wasn't great front-to-back. Overall, I felt there was sufficient material to get a good feel, so I went to work. I will say, while we're on the subject, that I feel it's better to have a narrow swell than a short swell and in this case, it's somewhat the opposite. When I say short, I mean front-to-back where the hook in the swell contacts your fingers. 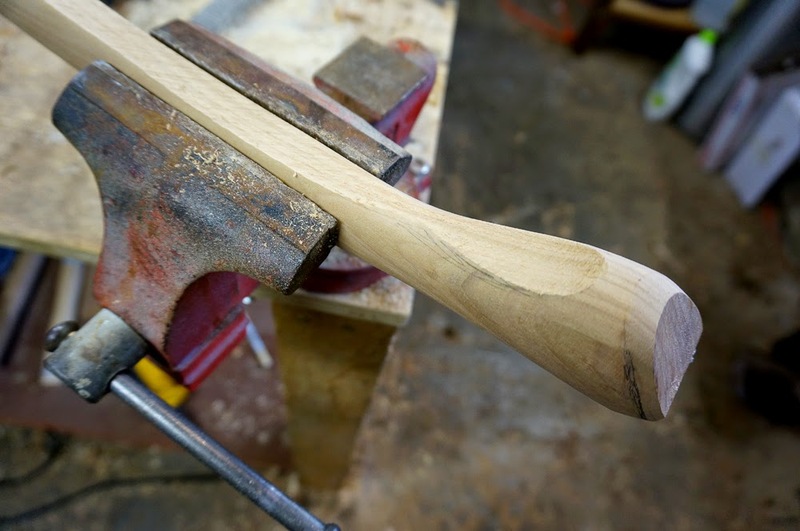 More often than not, this is where handles are missing material, and more and more I am finding that I'm not satisfied with anything but a rough handle seen in some recent posts. The "good handles" I referenced above, are those first pass handles I've been waiting and waiting on. So on this project I documented the process as I went along and that brings up the next common problem with off the shelf handles - the tongue. 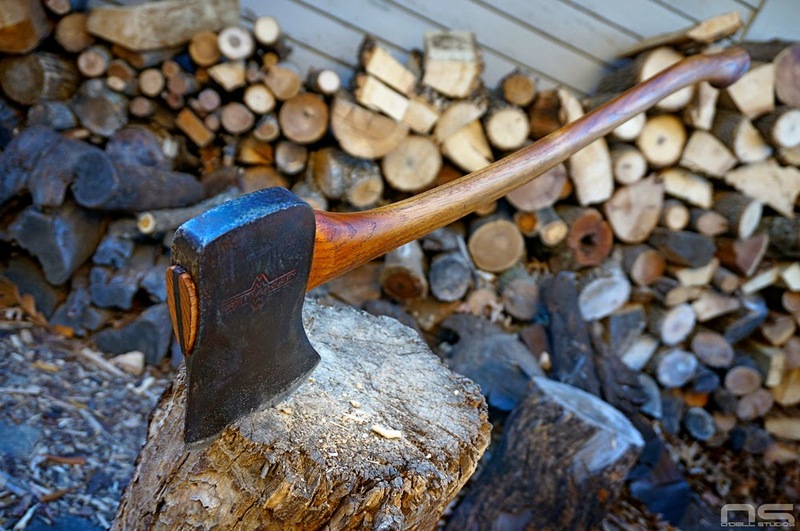 The tongue is the portion of the handle that is fitted inside the axe and when it comes already too small, it's just another little thing in a list of little things that can add up to an axe head coming loose sooner than it should. The new 32" haft was no exception. Luckily it was only short toward the front of the eye and I was able to get a good tight fit everywhere else. It is actually apparent in the picture - you can see that the tongue is narrower than the handle in both the front and the back. I lowered the shoulder in an effort to get to the thicker area, but in the end there was still a small gap at the point of the eye. This isn't usually a big deal, but I fill in these gaps just for good measure and I believe that if there is room for the handle to move, over time it will move there. I recently acquired a half round file and rasp for working the swell and that's where the process begins. 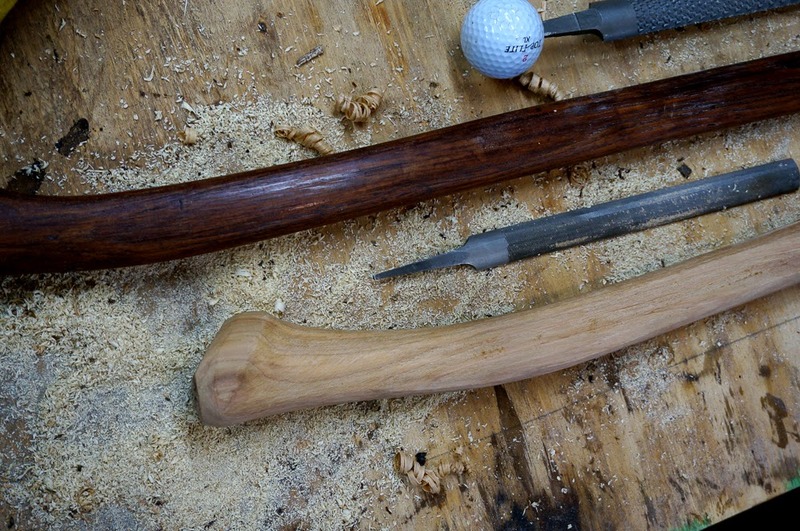 I found that I need the tight radius of the rasp to get the swell shape similar to that of my vintage handles and it really makes short work of wood without all the dust of the belt sander. 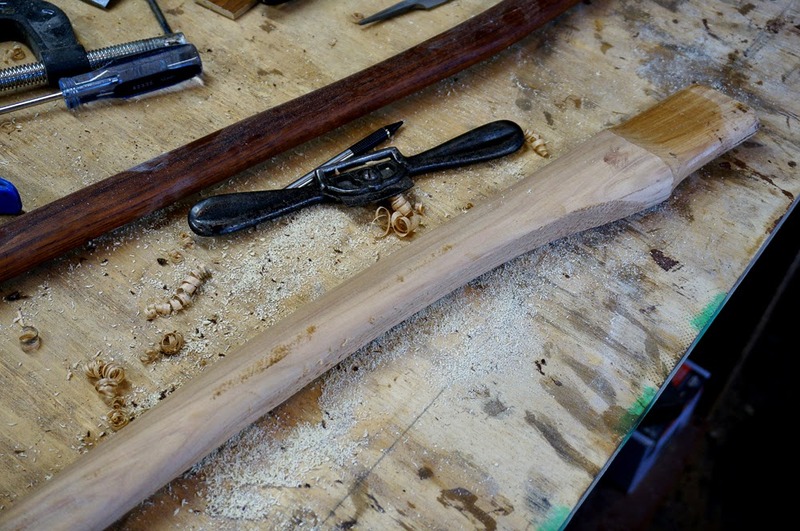 Once I had ripped down the basic shape with the rasp then I took it to the belt sander to thin the handle down over its length and reduce the shoulder to approximately the width of the axe head. The half round file is used to smooth out the swell and then I went over the surface with a couple pieces of broken glass to get it smooth. To make this project interesting I tried something new. 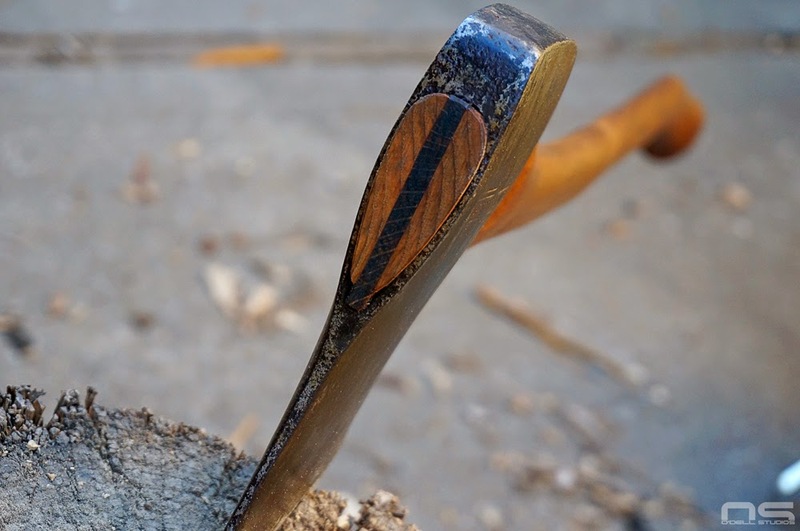 Many of us axe enthusiasts like the patina on the heads because it tells the tool's story and history, but what about the handle? 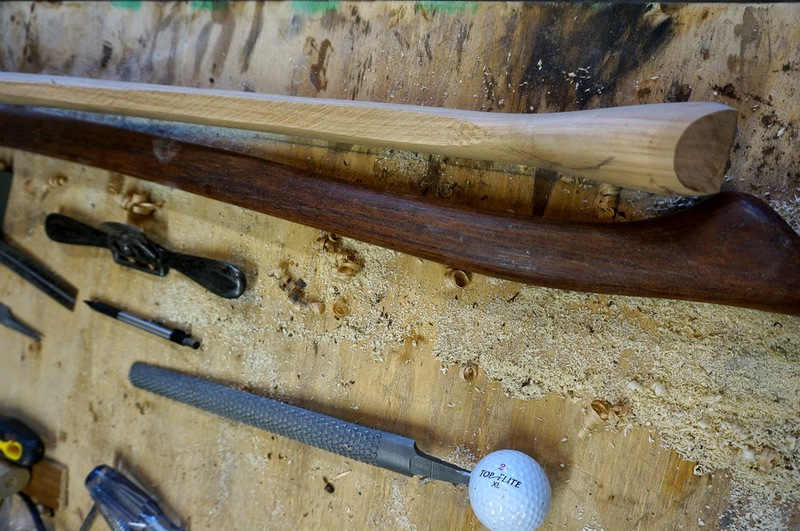 It will earn its own patina over time but it really takes a long time too, and until then, you've got this vintage head, dark and dinged with use, on a bright white piece of fresh hickory. Actually, since it's such a common sight I think it's really not that odd looking, but that's not to say that a battle worn handle, slicked over with use and darkened with age isn't also attractive. 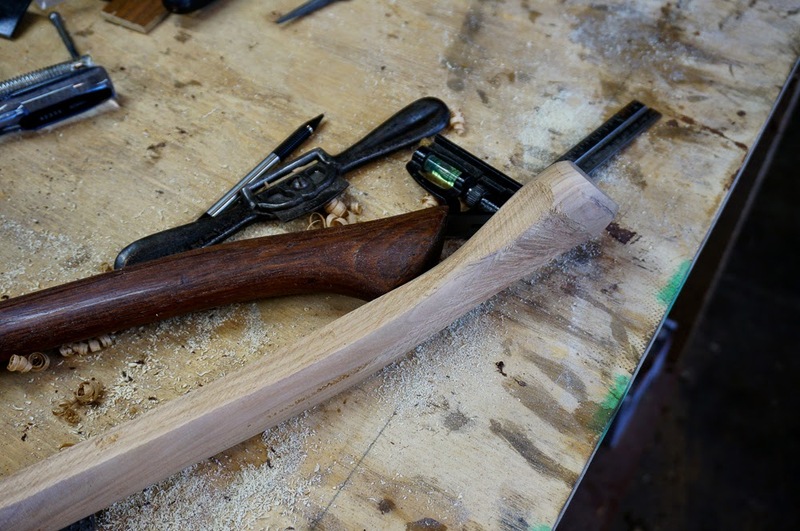 I wanted to see if I could make the handle match the head. To me, patina comes from use, but we've all seen the dry, gray wood that is the result of neglect and that's not what I was looking for. Most wood becomes darker and richer in color naturally when it's cared for, and even more so when it absorbs oils and dirt from use. That is the appearance I wanted to duplicate. The first thing I am sure a handle gets in it is dirt. What I have noticed is that the grain lines are usually darkened and I read that vinegar was used to age wood. I think the problem with vinegar is it ages the wood and just makes it look old, no well used. But, I have tubs of it sitting around full of black nasty sludge that comes off the axe heads and I thought it might just be a good first step. My vinegar solution did darken the wood and the sludge made the grain turn black instantly so I felt like that worked great. 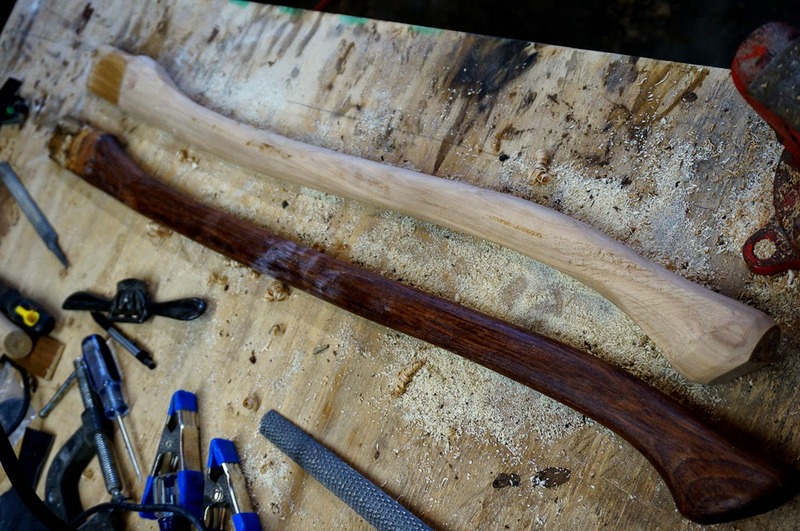 I already knew that simply applying boiled linseed oil would darken the wood and bring out the natural color as it always does, but I wanted more. I had some leather dye sitting on the workbench, some kind of rusty tan color and decided that had aught to do the trick. I put a little on a rag and rubbed it in with BLO at the same time to thin the color down enough that I could make some places a little darker by applying more, and leave other areas lighter. I made a few scratches in the wood for fun and I am very pleased with the final result.